The aim of any joint replacement is to preserve as much bone as possible. 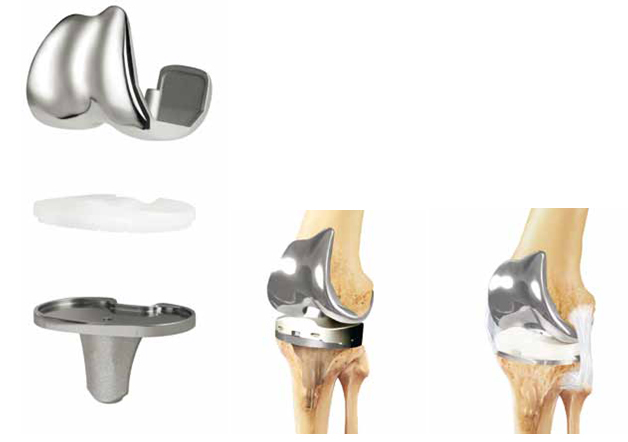 Over the last decades, apart from standard bilateral resurfacings, «bone preserving» knee implants have been developed, such as patella arthroplasty. 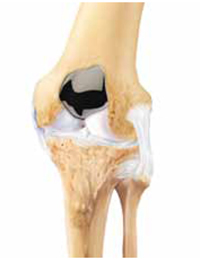 Monocondylar replacement of the knee allows younger patients to live a more active life. 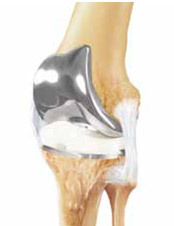 The monocondylar knee replacement is used when only one condylar side is damaged. A femoral component is anchored to the femur and a tibial component to the tibia. 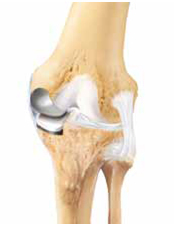 A polyethylene insert is placed between the two components to replace the meniscus in its shock absorbing role. In most cases, bilateral replacement of the surfaces is performed (bicondylar). In this case, the damaged surfaces of both femoral condylars are resurfaced with a femoral component and those of the tibia with a tibial component. Also in this case, the meniscus is replaced on both sides with a polyethylene insert. When possible, the ligaments are kept. When the stabilizing ligaments are also affected, a constrained knee prosthesis can be used. The tibial and femoral components are connected to compensate for the function of the missing ligaments without excessively limiting the movement of the artificial knee joint. The implants are generally made from titanium or cobalt-chromium alloys. Alternatively, innovative materials such as zirconium-niobium alloys can be used, which are highly resistant with ceramic surfaces. Durable plastic materials (polyethylene) have been shown to be very suitable as effective bearing surfaces. However, despite the use of these high quality materials, prosthetic joints can become mobilized and in this case they must be replaced through revision surgery. In general, existing artificial joints last for 15-20 years. Early mobilization of an artificial joint can be due to, for e.g., low quality bone or concomitant diseases, but also to variable factors such as obesity and excessive strain or excessive load. Approximately 12% of the population is allergic to nickel, while 5% is allergic to cobalt or chromium. Even if a person has a cutaneous allergic reaction to metals, it does not necessarily mean that he/she will have problems with an endoprosthesis made from stainless steel or a cobalt-chromium alloy – indeed, so far there is no clinical evidence to support this. However, for potentially allergic patients, alternative materials exist such as knee implants covered with titanium nitride or endoprostheses made from non-allergenic zirconium-niobium alloys. The permanent fixation technique chosen by the surgeon for the joint depends on various factors. These include age, physical activity and above all, bone quality. For fixation without cement, the bone quality must be good. The surfaces of the femoral and tibial components of the implant facing the bone are generally rough or have a structure similar to bone in order to favour bone growth over the implant. With cement fixation, the femoral and tibial components are firmly anchored to the bone using bone cement. The joint can be used shortly afterwards. Bone cement is made of two components, sometimes with the addition of antibiotics to prevent infection. The advantages of bone cement are the immediate fixation of the prosthesis and the excellent fixation properties in case of bad quality bone.